to change the number of questions, to change the passing score or even eliminate score reports completely without prior notice. You need to know how to perform an attended installation of Windows 2000 Server and an unattended installation of Windows 2000 Server. This includes creating unattended answer files with Setup Manager and automating the installation of Windows 2000 from start to finish if called upon to do so. Upgrading from Microsoft Windows NT® 4.0, deploying service packs and troubleshooting installations gone wrong should round out your skill set. You'll need to be able to make network resources available in a heterogeneous environment. That's often the point, isn't it? These resources include network services, printers, files, folders, and shared folders. You'll need to know how to use Dfs to simplify your task. You should be able to monitor, configure, troubleshoot, and control files and folders, files and folders in a shared folder, files and folders via Web services, and Web sites themselves. If you're going to take care of from 200 to 26,000 users and computers, as Microsoft says you should, you'll need to know a bit about hardware. This includes: configuring hardware devices, configuring driver signing options, updating device drivers, troubleshooting hardware problems. Most of the time you'll need to do this with the least amount of administrative effort possible. Not only does all that hardware need to work most, if not all, of the time, it should work well. You'll need to be able to monitor and optimize usage of system resources, manage processes, optimize disk performance and manage and optimize availability of System State data and recover System State data and user data when the need arises. Keep your data well and you've a much better chance of keeping your job. Study up on monitoring, configuring, and troubleshooting disks and volumes. Become intimately familiar with configuring data compression. Acquaint yourself thoroughly with monitoring and configuring disk quotas. Then find out how to recover from disk failures and everything will work out fine. You will likely be asked how to install, configure, and troubleshoot: shared access, a virtual private network (VPN), network protocols, and network services. Or perhaps how to configure, monitor, and troubleshoot remote access; install, configure, monitor, and troubleshoot Terminal Services; and install, configure, and troubleshoot network adapters and drivers. Some of the security tools you need to master before take the exam are the Encrypting File System (EFS), Group policies, Local Policies, and System Policies. You should also be able to handle all the security issues that relate to auditing, local accounts and Account Policy. And you should be ready to implement, configure, manage, and troubleshoot security by using the Security Configuration Tool Set. 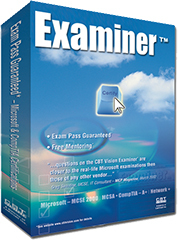 For a list of all the topics you need to know to pass this exam you can visit Microsoft's official web page for the 70-215 exam.